New Wiideocenter released! Now with Wii U support! The transcoding tool "Wiideocenter" has been updated to version 0.5.0 which fixes some minor bugs and adds preliminary Wii U support. Just download the programm and run it on your PC where all the files are stored. Using the built-in browsers of the consoles you can use it, to transcode all your Videos and watch them on the TV or on the Wii U Gamepad. So what is the Wii Mini? $99.99. It’s the magic price that all hardware eventually aspires to. And it’s exactly the price the Wii Mini will launch at. And that’s the point of the Wii Mini. Affordable gaming hardware for that ever alluring mass-market. "Yeah, of course it is," Nintendo of Canada’s community director Matt Ryan told Polygon when asked whether cost-cutting was the reason for the console’s omission of online and memory functionality. "We want the system to be as affordable as possible to everybody, and the widest audience possible. By taking out functionality, that allows us to keep the cost down. "The reason that we took [online functionality] out was that we don't believe that everybody needs that to play games. I mean, a lot of the Wii experiences, and there's over 1,400 of them that are disc-based Wii games, don't require online functionality for you to have fun. "There's a consumer out there, there are gamers who have not bought a Wii yet, and there are gamers who have a Wii and want a second one for the cottage, or the chalet, or whatever, who actually don't need the online functionality. When you look at that price, and you look at what you get for it, we're pretty confident that that's the right tipping point to get Wii Mini noticed." Nintendo has since the console’s announcement maintained its claim the Wii Mini is not scheduled for a release outside of Canada. We all know that’s nonsense, of course – the idea that Kyoto would spend R&D on new hardware destined to only be sold at Canadian retail is absurd. But that’s the current PR line, and it’s one that Ryan is still having to toe. "Frankly, I don't know when the R&D department in Japan decided that this was the product coming, and when the decision was made that it was going to be in Canada only,” he added. "It's not the fact that there's red in it, and we love red in Canada. That's not it at all. It's just, we're the market that's been chosen to launch this product, and no other territories has made the announcement that they're launching it. Whether or not we're a test market will have to be seen, but we plan on it working really well." Nintendo of Canada communications director Matt Ryan, has explained that the Wii Mini was designed to keep costs as low as possible. To keep costs low, and to provide a console with a release price of $99.99, Nintendo has decided to not include online functionality, an SD card slot, nor backwards compatibility with GameCube games.Speaking to Polygon, Ryan explains that, "we want the system to be as affordable as possible to everybody, and the widest audience possible. By taking out functionality, that allows us to keep the cost down." Ryan says that "there are gamers who have not bought a Wii yet, and there are gamers who have a Wii and want a second one for the cottage, or the chalet, or whatever, who actually don't need the online functionality." It is these consumers that Nintendo is targeting with the Canada exclusive Wii Mini, set to launch this Friday. Justifying the reason for not including online functionality, Ryan states, "a lot of the Wii experiences, and there's over 1,400 of them that are disc-based Wii games, don't require online functionality for you to have fun." The Wii Mini has been designed for families, late adopters, or those who aren't much of a gamer. This target market isn't looking for an online experience, and as Ryan states the Wii Mini "isn't designed for the player who's looking to have an online experience." When asked if Ryan was worried about it launching so close to the Wii U, Ryan said he wasn't as they are "fundamentally very, very different products." James Honeywell, head of consumer marketing at Nintendo UK, has said the platform holder is optimistic about Wii U's performance during the holiday period. Asked if he thinks Wii U's UK launch can replicate the strong start the console has made in the US, he told us: "Absolutely. ""The US has been a fantastic launch. Obviously that's a much bigger market, and so they've got more stock, but we're hoping for the same standard of success here in the UK. "We've got a fantastic launch line-up, and we think it'll be sold out in the first few days, if not the first few hours. But after that we've got really strong deliveries of follow-up stock. "We hope to live up to the same kind of success with the Wii," Honeywell added at last night's midnight launch. "As you can see, people are really excited about it. Time will tell." Nintendo claims to have sold 400,000 Wii U units during the system's first week of availability in the US, with Nintendo of America president Reggie Fils-Aime saying it's "essentially sold out of retail". That was quick. Scarcely two hours after Best Buy spoiled the party, Nintendo is launching the Wii Mini. The crimson console is billed as a Canada-exclusive for now -- we're reaching out to confirm if and when it might go elsewhere -- and is clearly meant to catch those families that find the Wii U(or even a regular Wii) too pricey. To get there, though, they'll have to make some big sacrifices. The Wii Mini cuts out bothGameCube compatibility (seen in some regular Wii variants) and, more importantly, internet access; unfortunately, this won't be your budget Netflix box. Still, when gamers in the Great White North can pick one up on December 7th for $100, it might be the ideal fit for that TV in the basement or the occasional party. The Nintendo Wii Mini has been leaked online by Best Buy Canada. Rumours had circulated yesterday that a Nintendo Wii Mini was set to be released next month, with Best Buy now revealing the news to be true. The listing gives the console a release date of December 7th. No price has been given for the system however. 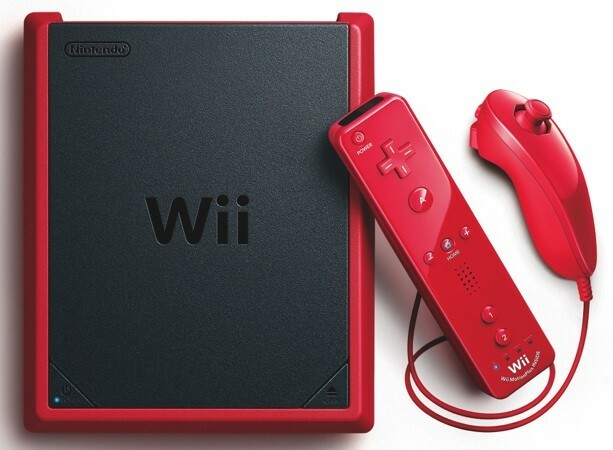 The Wii Mini appears as a black and red console, with the Wii Remote completely coloured in red. Is a Wii Mini on the way? An unsubstantiated rumour has suggested Nintendo will unveil a second new console before Christmas. Nintendo World Report claims to have word from “an internal release schedule from a major retailer” that it says it is “unable to disclose”. In it is mentioned a SKU including a Wii Mini console, sensor bar, nunchuk and Wii remote Plus. A release date of December 7th is mentioned. The Wii has previously undergone a very slight redesign that made the unit smaller at the expense of a few ports being lost. But this is the first talk of a ‘proper’ redesign along the lines of the Xbox 360 S or either of the PS3 Slims. Still, unless the claims are backed up from other sources MCV advices extreme scepticism. 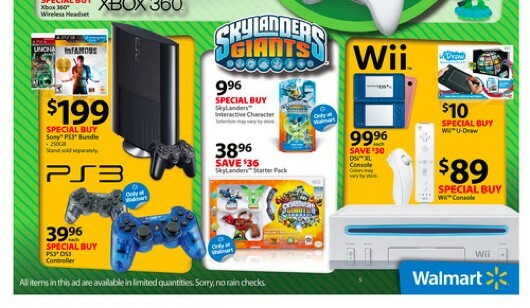 For those brave enough, and cheap enough, to venture into Walmart after 8pm on November 22, some Black Friday deals await, including a 4GB Xbox 360 with a Skylanders: Spyro's Adventure starter pack for $149, a Wii for $89, and a 250GB PS3 with the Uncharted Dual Pack and the Infamous Collection for $199. The retailer is also discounting some games, including Epic Mickey 2, Modern Warfare 3, FIFA Soccer 13, NBA 2K13, Borderlands 2, Medal of Honor Warfighter, and Just Dance 4, to $25 each. $15 games include Dance Central 3, Max Payne 3, Black Ops, and Spec Ops: The Line. Dead Island, Gran Turismo 5, and more are $10. Finally, in the offer that is most likely to confuse and irritate people, Walmart is advertising "Wii U-Draw" for $10. That's actually the uDraw Game Tablet for Wii, and not the Wii U, which also includes a tablet. Some kind of fight is going to break out over this confusion, we're afraid. Apple’s range of iDevices dominate the Christmas lists of kids aged 6-12 in the US. Its success comes at the expense of Nintendo’s Wii U, which is forced into second place according to new data from Nielsen. Apple’s iPad is the most sought after gift followed by Wii U, iPad Touch, iPad Mini and iPhone. Around half of the kids surveyed expressed interest in an iPad, up from 44 per cent the year before. 29 per cent will be asking for a Nintendo 3DS. Xbox and PS3 also feature highly with 25 per cent and 26 per cent respectively. It’s bad news for Vita, though – Sony’s machine will feature on the Christmas lists of just 14 per cent of those questioned, which is lower than the 18 per cent who’d like a PSP. UPDATE: Amazon is currently offering a 250GB Xbox 360, 12 months of Xbox Live and a copy of Halo 4 for £150. The console alone usually costs £159.99.The bargain is currently listed on HotUKDeals but is seemingly unrelated to Amazon's Black Friday deals.Users can also add FIFA 13 or Need for Speed: Most Wanted for £20 or Call of Duty: Black Ops for £30.ORIGINAL STORY:Online megastore Amazon has kicked off its yearly Black Friday celebrations - a week of dramatic price-cuts on items available for a limited time or until stock runs out. All the deals are viewable on Amazon's Black Friday Lightning Deal page. Sale prices are only revealed when items go live.Available now (for just over an hour longer) are cut-price copies of WWE '13, this year's entry in the long-running wrestling series. The sale price gives you a third off, meaning £16.99 for Wii copies or £24.99 on PS3/Xbox 360.At 7.45pm UK time this evening Amazon will begin a sale on uDraw for Wii and Xbox 360.At the same time, PS3 and Xbox 360 copies of Darksiders 2 will also go cheap.The day started with a huge PlayStation 3 bundle offering a new 12GB super slim console, PlayStation Move, Wonderbook gadget and the Harry Potter-themed Book of Spells game.During the writing of this article the item sold out at its Black Friday price (£169). It's now back at its pre-deal price of £199.We'll keep this article updated every morning with the coming day's deals.